This article is part of my Christmas 2017 compilation. 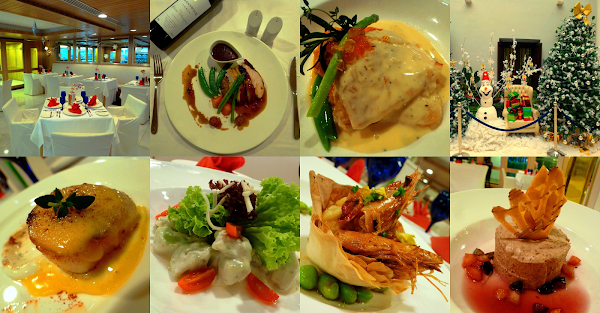 The Spice is a semi-fine dining Western restaurant in Royale Chulan Penang. Located next to the hotel's swimming pool on Level 2, The Spice is where the Friday Night Poolside BBQ is held in the event of rain. One of the most prominent features of this restaurant is an aquarium that is filled with colorful tropical fish. 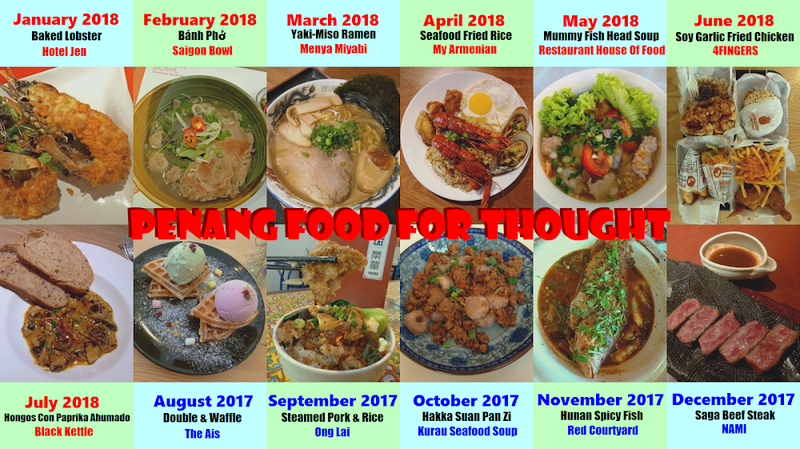 Although it is still nearly a month away from Christmas, The Spice has already been decorated with festive ornaments to reflect the joyous spirit of the year-end festival. This evening, the restaurant gives a sneak peek of the Yuletide Western Set Dinner, a 5-course meal which includes amuse-bouche and dessert. As soon as we are seated, fresh bread roll is served. Warm from the oven, the roll delights my appetite with its pleasant aroma. Premium butter is provided. Amuse-bouche is a small starter in which the chef sets the tone of the meal. This French phrase literally translates as "mouth amuser". Interestingly, the French do not use this term, instead preferring to say "amuse-gueule". This evening's amuse-bouche is Scallop Gratin With Cilantro Mayo. Although slightly smaller than its Hokkaido counterpart, the American scallop is delectable nevertheless. The accompanying dressing carries cooling aroma of coriander which accentuates the scallop's intrinsic sweetness. Microgreen is used as garnish. Proceeding to the appetizer, Prawn & Mango Salad is another masterful brainchild of the chef. At the heart of the salad are cooked shrimps and mango cubes. Held together by lime aioli, both ingredients are presented in a pastry cup. As for plating, the salad is surrounded by individual pieces of edamame (枝豆). If you are fond of soup, you are in for a treat next. Spiced Winter Melon & Apple uses double cream to achieve the desired consistency. What's also interesting is the interplay between cooling taste of winter melon and occasional tartness of diced apple. Garlic croutons are added for the finishing touch. After soup, orange mint sorbet is served in order to reset the palate prior to the main dish. There are three choices for main dish; the most popular choice is the Hand-Carved Roast Turkey With All The Stuffing. Roasted to golden perfection, the turkey is flavored with a mixture of cranberry sauce and turkey au jus. Buttered vegetables and mashed pumpkin are presented on the side. During the actual Christmas meals, Yorkshire pudding is also included. The second choice of main dish comes from the marine kingdom: Steamed Sole Fish. Dressed in butter sauce (beurre blanc), the fillet is succulent indeed. Juicy asparagus and snow peas serve as counterbalance to the fish. During the actual meals, this dish comes with a pumpkin soufflé too. Alluring salmon roe on top provides aesthetic appeal. Potato & Rocket Gnocchi is tailored for vegetarians. Gnocchi, made from semolina, is dressed in creamy sauce made from blue cheese and salsa verde (herb sauce). Accompanying vegetables are Romaine lettuce, red leaf lettuce and cherry tomatoes. The actual plating will include a piece of parmesan crisp. This evening's dessert is Chocolate Parfait. Prepared from cocoa, cream, egg and sugar, this custard-like chocolate mousse carries reasonably rich cocoa taste. The French dessert is further sweetened with strawberry sauce that contains diced strawberry, kiwifruit and plum. Cast sugar serves as icing on the cake. Towards the end of the meal, one is served a platter of cheese followed by a drink. Coffee is my preferred choice to conclude the evening. I generally opt for unsweetened black coffee to truly enjoy the coffee's freshness. The Spice's Yuletide Western Set Dinner is served between 7:00pm and 10:30pm. There is a similar menu on New Year's Day. 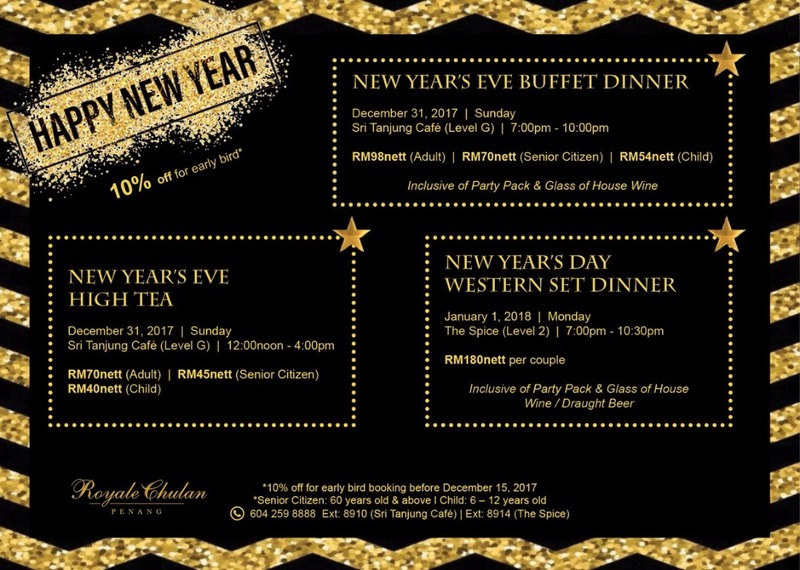 Priced at RM180.00 net per couple, the evening meal includes a party pack and 2 glasses of house wine. Wine can be substituted for draft beer should diners prefer so. 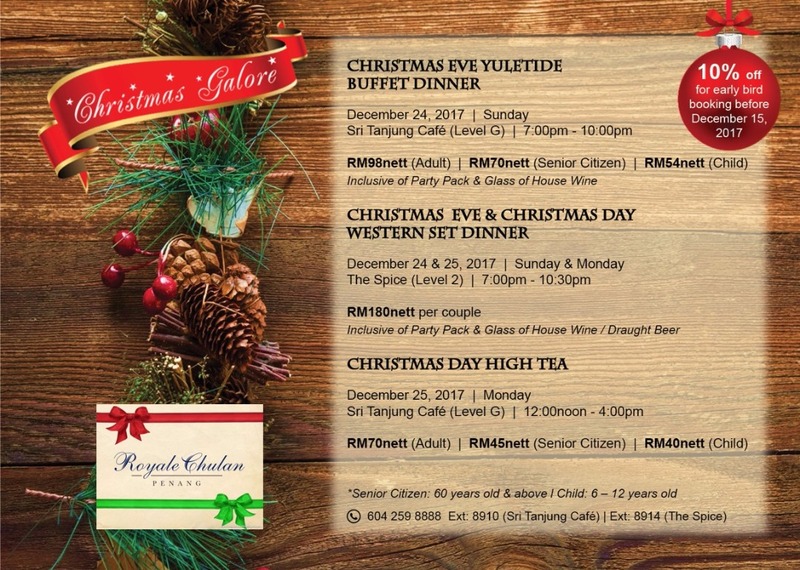 In addition to the 5-course dinner, Royale Chulan is also offering Christmas-themed buffets at Sri Tanjung Cafe. Held under a more casual settling, the buffet is ideal for families with young children. It is also a great dining idea for year-end reunion with friends. To reward early birds, the hotel is offering 10% discount for all bookings before 15 December 2017. 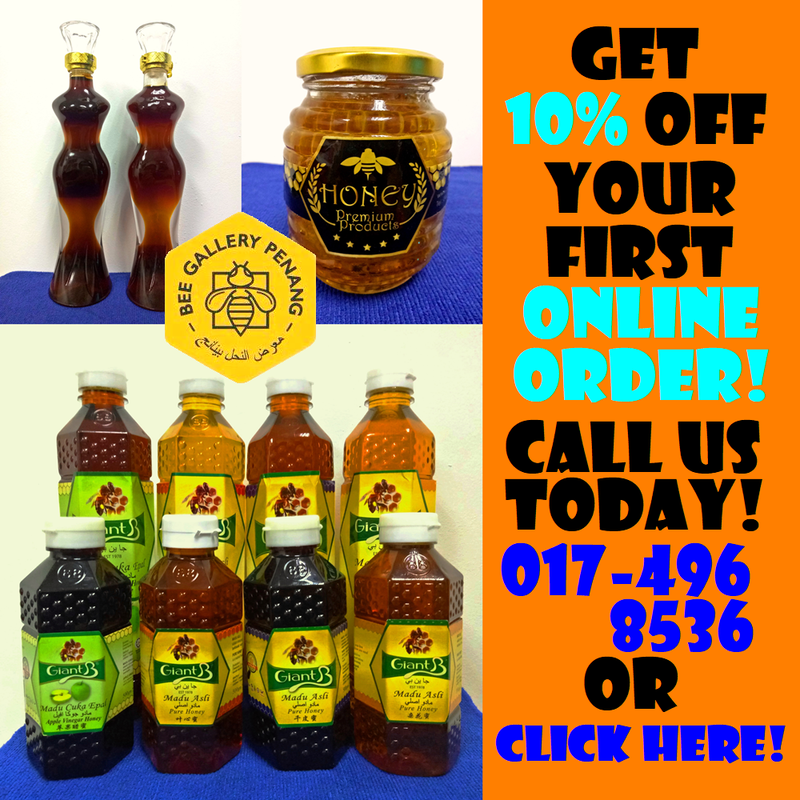 Directions: From the ferry terminal at George Town, turn right and drive along Weld Quay (Pengkalan Weld). Royale Chulan Penang is located shortly on the left, at the same block as Made in Penang Interactive 3D Museum. There is a small lane right after the hotel, which leads to the main entrance and multi-level car park. At the front desk, restaurant patrons can get their parking tickets validated for a flat rate of RM5.00 per entry.